This photo is of the Best of Brass crew. David Short (cameraman) who made the photo available thinks it was taken at the Derby Assembly Rooms. Best of Brass was a knockout competition where brass bands competed against each other. The finals were sometimes held at the Assembly Rooms, Derby, so this photo is may be from one of those occasions. Ken Griffin was the producer, and Gerald Harrison the presenter. Best of Brass went out between 1979 and 1988. 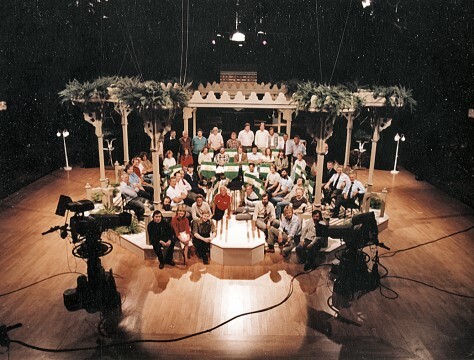 The photo includes Chris Harris in the middle towards the right with the dark beard, along with Ian Collins (VT editor) at the back, John Allinson (lighting director) and Phil Vaughan centre left and Dave Ballantyne and Bob Meikle centre right. Next to Chris could be Andy Mosedale and is it James French (camera) bottom left? Possibly Mahendra Chauhan? in the centre and Pete Eggleston on the left. Kay Alexander is next to James bottom left. Terry Powell (costume) is next to Shelley Webber (make up). Possibly Norman Steemston with the beard next to the Camera bottom right. AFM Debbie Hood is also in the picture. (Thanks to Stuart Gandy, Dave Bushell, Lesley Weaver, Julian Hithcock and Terry Powell for identifying people). Please add a comment if you have more information to add.